Following the procedure Repeat synthesis of 2-(4-chlorophenyl)-3-oxopentanenitrile - TM-DP-2-3, on larger scale with THF instead of ethanol and potassium butoxide instead of sodium methoxide. 4-chlorophenylacetonitrile (10.1 g, 63.0 mmol), ethyl propionate (6.56 g, 64.1 mmol), and potassium tert-butoxide (14.44 g, 128.9 mmol) were combined in THF (100 mL). The colourless solution turned red as soon as the tert-butoxide was added. The red mixture was stirred for 24 h.
The reaction product was added into 50 ml water, and washed with tert-butyl methyl ether (2 x 40 mL.) The aqueous portion was washed with 1M HCl (3 x 30 mL), causing a colour change from dark red to orange. The organic portion was dried over Na2SO4, filtered and concentrated in vacuo to give a pale orange oil. The crude product was given the identification SGS 10-2-crude. Initial TLC (1:1 hexane:DCM) analysis indicated starting material had disappeared. 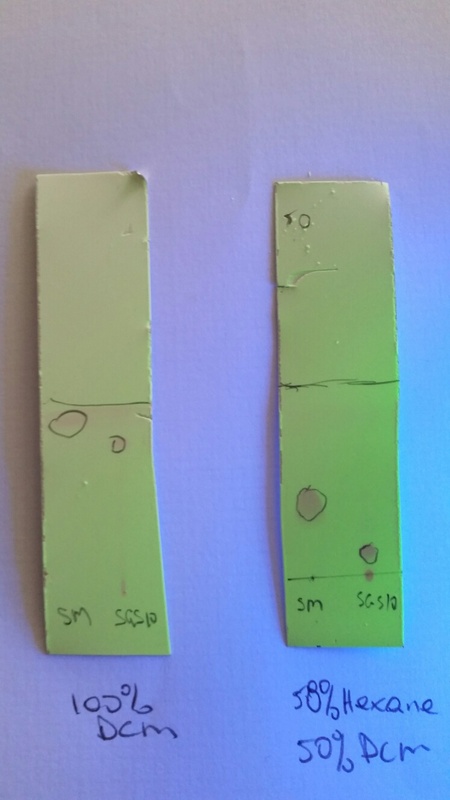 Two products were identified, one product slightly less polar than starting material and a second highly polar product on the baseline. TLC analysis in 100% EtOH indicated baseline material was a single compound Rf=50%. The crude product was purified in the next report.